The Royal Challengers Bangalore have not managed to get off the blocks in this tournament so far. They have been totally outplayed in 3 out of their 4 loses and will be looking at someone to inspire them and get them over the line. The Kolkata Knight Riders on the other hand are coming off a loss to the Delhi Capitals though super over, but will still stay positive as they got much closer than they should have after their initial batting collapse and the average bowling performance. However, they have been depending a lot on Andre Russell to fire every time and will be useful for them to win a match without his contribution which will give them confidence going forward. Out of the 23 matches played between the two teams, the Knight Riders have had the edge winning 14 matches. Virat Kohli, for the Royal Challegers Bangalore, has had a poor start to the tournament by his standards. As captain and as the best player in the side, they will need him to play a special innings and take the team through. He will have to come up with the goods if they have to stay alive in the tournament and tough circumstances can get the best out of Virat Kohli. Robin Uthappa, for the Kolkata Knight Riders, has been timing the ball very well in this IPL. He played a very good innings of 67 against the Kings XI Punjab and the pitch at Bengaluru will also suit his style of play, hence will be looking to get another big score in this tournament. The Royal Challengers Bangalore will be looking to find the right combination and we can expect a few changes in the lineup. They might look at bring in Tim Southee to strengthen the death bowling. Shimron Hetmyer might miss out as he has looked completely out of sorts in this tournament. There might be a temptation to play Klaasen as well who can provide the middle order power that they have been missing. The Kokata Knight Riders will be looking to swap in Sunil Narine for Nikhil Naik which will possibly be the only change. The pitch at Bengaluru has been playing well off late and hence we can expect a high scoring game. 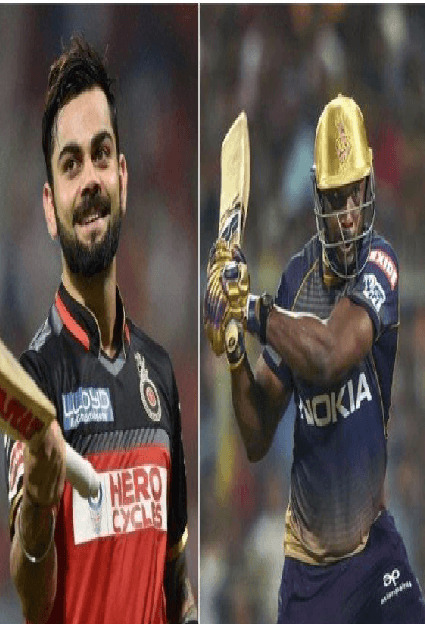 The Knight Riders definitely have the edge in terms of form and past records, but for this particular game, the Royal Challengers Bangalore will have a good chance to win since they will be looking to play in a free spirited fashion since there is not much to lose from being bottom of the table. This approach can really get the best out of a team like RCB who have a lot of talent in the side. If they find a way to stop Andre Russell, then the Royal Challengers Bangalore are definitely in with a chance. The Royal Challengers should look at opening with pace against Sunil Narine to diminish his impact with the bat. Russell is another player in the Knight Riders line up who they should look to dismiss early on, They should use Chahal who is a smart bowler and with his variations can get Russell playing the wrong shot early on in his innings. The Knight Riders on the other hand should look at using Chawla against Kohli and Devillers who have struggled against the googly. They should look at attacking early on against the Royal Challengers Bangalore as they are at their best during the Power plays and tend to lose momentum towards the end of the innings.